Dharambir Singh is one of the most prominent North Indian Classical musicians in the West, based in the U.K. He studied Sitar with the late maestro Ustad Vilayat Khan, and has been performing and teaching widely in Europe, playing at major festivals in England, Spain, Germany, Italy, Canada and USA. He has worked extensively with cross-cultural musicians in various music projects. Dharambir has researched many aspects of Indian Classical Music and has created valuable technology solutions and even software for teaching Indian music in the West. He has been honoured with an MBE (Member of British Empire- the highest award given by the Queen of England) in 2011 for his contribution in the field of Indian music. 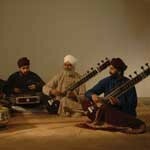 His wife Gunwant Ji is a professional Indian singer, and his three sons have become professional Indian musicians, playing sitar, tabla and santoor, performing concerts with their father. Dharambir Singh will visit the Costa del Sol for 3 weeks around Easter-time giving concerts in Fuengirola, Marbella, Malaga, Torre del Mar and Nerja. Exact dates can be found in La Chispa’s email newsletter and web site. He is available for bookings and is keen to meet other musicians and play with them and invites interested students for sitar and tabla lessons. This entry was posted in Open Mind and tagged concerts. Bookmark the permalink.